When Mike and I moved from our downtown Vancouver apartment to a residential neighborhood suite, our home lost a bit of charm. The downtown apartment had several design and home decor elements built into it, like a fireplace mantel, windows that opened from the bedrooms upstairs into the “courtyard” living room and “flower box” shelves for books, picture frames or sno-globes. In truth, we didn’t have to do anything to make the house look spectacular except for keeping it clean and sweeping up the cat hair tumbleweeds that Random (our kitty) was so good at creating. It was a gorgeous place. We loved it. And, it made us lazy. We didn’t have to carve out a “home” within our new place — someone’s creativity had already done that. We didn’t have to come up with ideas to add depth to the walls — someone had done that with the faux brick “reveals” on the wall. It was someone else’s home — that we just maintained. When we first moved into the basic suite, I missed the home decor and design elements of the previous pad. I felt surrounded by empty walls, lacking in character. There wasn’t a whole lot of depth or even a “homey” feeling. It was blank walls. It took a bit before I realized that they were just really big canvases waiting for my creativity to add the comforting details and hallmark signs of my definition of home. This was my chance to explore, design and create a home for the two of us. 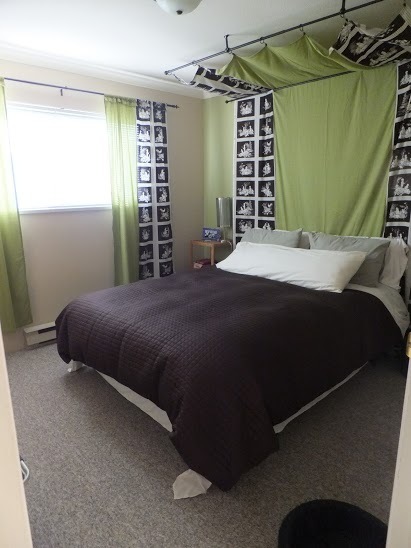 I had seen a few images of DIY headboards made of cloth that extend up the wall to create a canopy over the bed. I liked the idea of elongating the queen-sized mattress and adding flair to the walls. Mike and I visit a few fabric stores and decided upon a sage green fabric and a white and brown vintage farmhouse-ish print for our new headboard. I cut the brown and white block print down the middle and stitched it together — all 15 feet of it — on my sewing machine. With Mike’s help, we attached a curtain rod to the ceiling in the middle of the bed and a second one closer to the wall to help with draping the long fabric for a canopy. 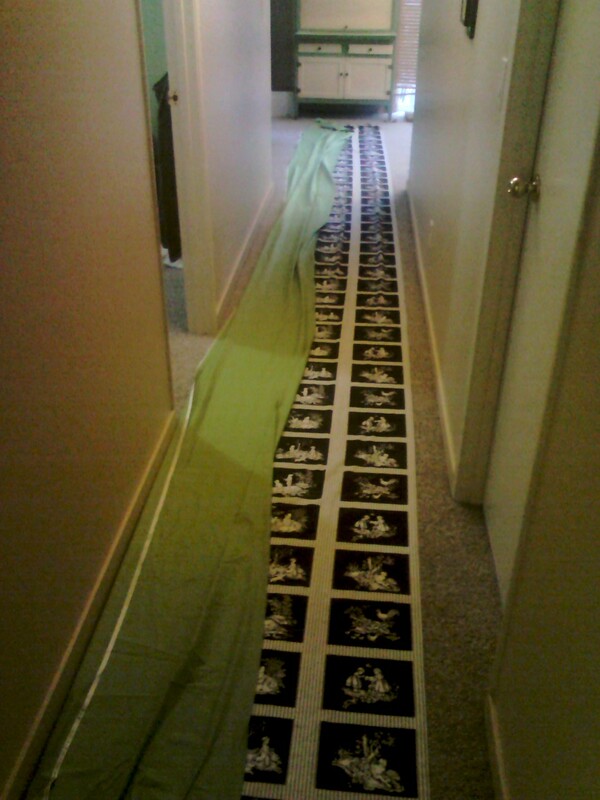 The project itself was an easy one, it was just cutting and then stitching in a very long straight line. But it was more than just the ease of the project that made it special. This was the first step in Mike and I shaping our home into something we enjoy. Into something that was created by us for us. The design on the walls or hanging from the ceiling was placed there via our own creative process. Lesson learned here: It doesn’t take much to make a house a home — it just takes your own touch. Don’t be afraid to inject a little bit of yourself into the decor — it’s what makes it your home. This is your comfort zone — make it yours.